The Gunners have failed to progress beyond the last-16 stage of the competition over the last four seasons. 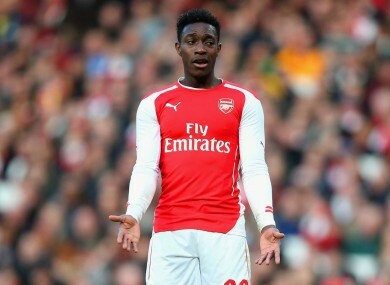 Danny Welbeck is not worried about Arsenal's recent Champions League record. DANNY WELBECK INSISTS Arsenal are not dwelling on past failures as they prepare to take on Monaco in the Champions League last-16. The Gunners have fallen at this stage of the competition in each of the past four seasons, with Bayern Munich conquering Arsenal last time out. However, Welbeck says that he and his team-mates are paying little attention to the history books, and believes the Gunners have enough quality to overcome the Ligue 1 side and progress to the quarter-finals for the first time since the 2009-10 season. “It is not something that comes into discussion,” he told reporters at a pre-match press conference. “You can’t be looking into the past too much about what you could have done, it is about making things right and learning from that experience and taking it into the next game. “We know that it’s going to be a tough tie for us, it’s going to be played over two legs so we’re not just going to be focused on this one. But obviously getting the right result will set us up nicely for the next tie. Arsenal’s meeting with Monaco marks the first time Arsene Wenger has faced his former employers, and Welbeck says the club have prepared well ahead of the first leg tie at the Emirates Stadium. “We have analysed their team and we are looking forward to it,” he added. Email “We don't care about previous Arsenal failures at this stage”. Feedback on “We don't care about previous Arsenal failures at this stage”.